How does ocean drilling help us learn about dinosaurs? 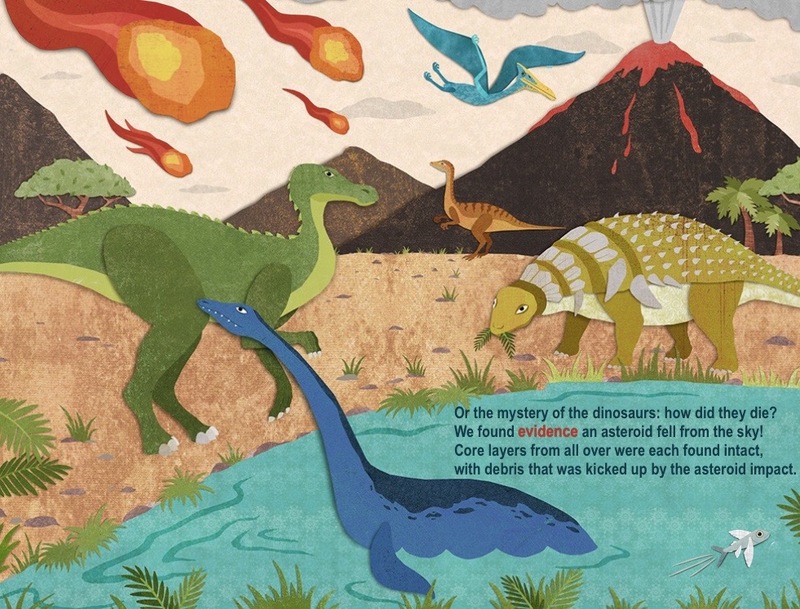 Six to ten-year olds probably know more about dinosaurs than every non-paleontologist adult on Earth, but they may not know much about how scientists learned those things that they know about dinosaurs. There are some free resources available that elementary, intermediate and middle school students can use to help them understand how ocean drilling can help us learn more about dinosaurs and the Chicxulub impact, and, in doing so, help make the expedition more meaningful to the students/kids in general as they follow along. Uncovering Earth’s Secrets: Science and Adventure on the JOIDES Resolution is a free illustrated, rhyming eBook that introduces kids to scientific ocean drilling. It is available for free in both a PDF version and an interactive version for Macs and iPads that includes multimedia pop-ups. Where Wild Microbes Grow: The Search for Life Under the Seafloor is also a free illustrated, rhyming eBook that introduces kids to how scientific ocean drilling is helping us discover life in unlikely places. It is of interest to Chicxulub Crater fans because one of the research goals of the expedition is to see how microbes recolonized the crater after the impact stripped it of life. Ocean drilling has actually been providing us information about the Chicxulub impact for years. You can learn about some of the K-Pg Boundary cores drilled from the seafloor and the discoveries they provided in the Blast from the Past poster. You can download a free PDF of the poster here. (Full disclosure: I wrote some of the resources, but they’re all free so hopefully this doesn’t come off as shameless self-promotion).